That’s six “9”‘s then. I suppose I could say it’s over (point) 9000, but that would also result in me having to apologize with great immediacy for inflicting such a terrible joke upon you all. 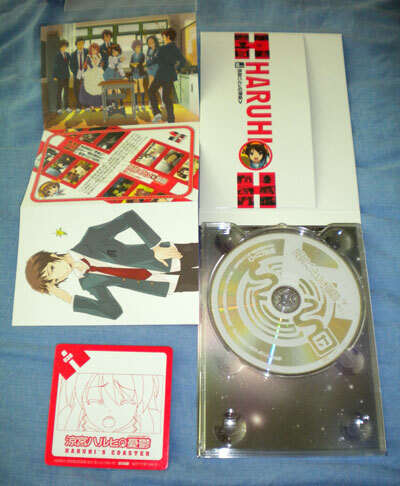 This is the last of the Japanese DVD releases for the second season of Haruhi, which was actually released about a month ago now, but I’ve been sitting on it for the simple reason that I sat on the previous months volume for over a month as well, and there’s nothing quite like a bit of consistency. Anyway, since it seems like a befitting thing to do for the final volume, I guess I’ll reiterate to context for the whole thing. 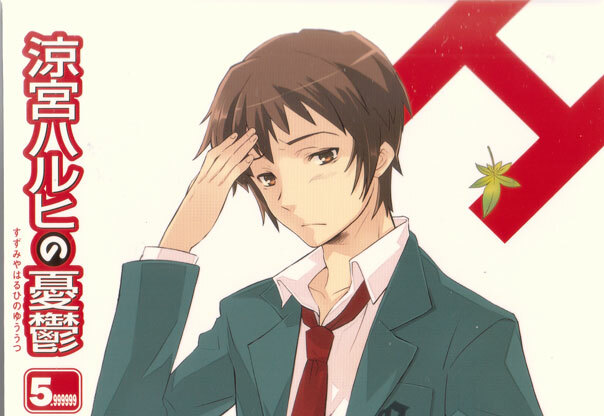 I’d imagine everyone reading this is aware of Haruhi, and I’d imagine everyone is aware of the fact that the show likes to do quirky things, such as having the episodes out of order, starting the series with a badly-shot fan movie or, well, making the same episode eight times over. This “charming” quirkiness carried over to the DVD release in Japan. You see, the disks for both seasons were released in two variants – the regular release, and the special editions. Unsurprisingly, the special editions come with some additional extras – a second disk (soundtrack CDs for the first season, extras DVDs for the second) and some postcards featuring art from the two different cover variants. Of course, there’s nothing particularly spectacular about that, and as such is certainly not befitting of a release of Haruhi. Therefore, Chairman Kadokawa formulated a terrifying plan – random extras. This wasn’t a particularly harrowing experience for the first season, since this secondary extra was kind of rubbish. With each volume of the series, you got a sheet of stickers featuring little screencaps from the show with a short comment. The exact sheet you got with each release, however, was entirely random – and they were numbered just to make sure the purchaser was aware of the fact. Given how expensive these disks are, it’s not like anyone is going to go out and buy multiple copies just to get all of them – it’s simply not feasible given how random they were. That isn’t actually the really evil part, though. The real kicker was what was known as the “SP” sticker sets. These random sheets of stickers were inserted into a limited number of copies of the SE release of show at random – that’s right, there was an extra that those paying the extra to get the fairly expensive LEs of the show weren’t even guaranteed to get. That’s a pretty good way to annoy collectors if I’ve ever heard one. My score from the first series of Haruhi was actually better than average in the end – out of the volumes for which SP stickers were a possibility, I got them for five of the seven volumes (although I’ll point out that I got the same SP sheet in two different volumes). Chairman Kadokawa, however, clearly decided that this wasn’t bad enough, and therefore formulated an even more horrific plan for the second series. Out went the sticker sheets, and in came a set of coasters – piece of card featuring line art upon which you could theoretically rest your beverage containers if that wouldn’t ruin the collectors value of them. Once again, these were random, and once again, there was a set of rare SP coasters, at seemingly even smaller allocations than the SP stickers. But that wasn’t evil enough, because, honestly, no-one really cares about something as crappy as a couple of coasters. As such, an additional random bonus was formulated, one which could, quite possibly, have some degree of nerdy collectors value to it – a film clipping. Basically, they printed the episodes from each volume of the series onto film, sliced it up into four frame chunks, and slipped the results into random SE sets. This effectively created a terrifying double-lottery – Not only were your chances of getting a film strip limited, but what your film strip featured could vary from the massively desirable Nagato in a swimsuit to the rather less exciting Kyon’s hand and a candle. So, what’s being chronicled here isn’t so much me watching the show on DVD (really, I have absolutely nothing new to add about Endless Eight at this point), more the “exciting” experience of collecting the import release of the show. When I left this series of posts a few weeks ago, my haul was at three filmstrips (all, perhaps annoyingly, featuring Kyon in some manner) and one SP coaster. In terms of volume counts, that was four with additional “random” extras, three without. The balance was in my favour. Alas, it’s the standard extras only. Indeed, the Chairman has forced me into a draw with this one. I think this is part of some kind of nefarious plan to force me into buying whatever limited edition release of the Disappearance movie they put out in some kind of attempt to redress the balance. I doubt I’ll be able to resist.